O God, who for the spreading of your Church crowned Saint Peter Chanel with martyrdom, grant that, in these days of paschal joy, we may so celebrate the mysteries of Christ's Death and Resurrection as to bear worthy witness to newness of life. Through our Lord Jesus Christ, your Son, who lives and reigns with you in the unity of the Holy Spirit, one God, for ever and ever. O God, who willed to direct the steps of the Priest Saint Louis along the way of salvation and of the love of Christ, in the company of the Blessed Virgin, grant us, by his example, that, meditating on the mysteries of your love, we may strive tirelessly for the building up of your Church. Through our Lord Jesus Christ, your Son, who lives and reigns with you in the unity of the Holy Spirit, one God, for ever and ever. St. Peter Chanel was born in France in 1802. He was ordained a priest in 1827, and engaged in the parochial ministry for a few years; but the reading of letters of missionaries in far-away lands inflamed his heart with zeal, and he resolved to devote his life to the Apostolate. He joined the Society of Mary (Marists), and in 1836 he embarked for Oceania. He died a martyr's death on the island of Futuna, Melanesia. He is called the apostle of Oceania where he spread the Gospel. St. Louis Mary de Montfort during his relatively short life as a missioner, especially among the poor, had to overcome considerable setbacks and opposition. He founded the Daughters of Wisdom and before his death established a society of priests, the Company of Mary, to carry on his work. His book on True Devotion to the Blessed Virgin has been widely diffused in many languages. According to the 1962 Missal of Bl. John XXIII the Extraordinary Form of the Roman Rite, today is the feast of St. Paul of the Cross. His feast in the Ordinary Form of the Roman Rite is celebrated on October 20. On April 18, 1841, a band of native warriors entered the hut of Father Peter Chanel on the island of Futuna in the New Hebrides islands near New Zealand. They clubbed the missionary to death and cut up his body with hatchets. Two years later, the whole island was Catholic. St. Peter Chanel's death bears witness to the ancient axiom that "the blood of martyrs is the seed of Christians." He is the first martyr from Oceania, that part of the world spread over the south Pacific, and he came there as the fulfillment of a dream he had had as a boy. Peter was born in 1803 in the diocese of Belley, France. At the age of seven, he was a shepherd boy, but the local parish priest, recognizing something unusual in the boy, convinced his parents to let him study, in a little school the priest had started. From there Peter went on to the seminary, where it was said of him: "He had a heart of gold with the simple faith of a child, and he led the life of an angel." He was ordained a priest and assigned to a parish at Crozet. In three years he had transformed the parish. In 1831, he joined the newly founded Society of Mary, since he had long dreamed of being a missionary; but for five years he was assigned to teach at the seminary in Belley. Finally, in 1836, his dream was realized, and he was sent with other Marists to the islands of the Pacific. He had to suffer great hardships, disappointments, frustration, and almost complete failure as well as the opposition of the local chieftain. The work seemed hopeless: only a few had been baptized, and the chieftain continued to be suspicious and hostile. Then, when the chief's son asked for baptism, the chief was so angry that he sent warriors to kill the missionary. 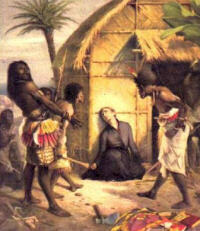 Peter's violent death brought about the conversion of the island, and the people of Futuna remain Catholic to this day. Peter Chanel was beatified in 1889 and canonized in 1954. Learn more about the Society of Mary. Read a little about the island where St. Peter Chanel suffered martyrdom. Louis's life is inseparable from his efforts to promote genuine devotion to Mary, the mother of Jesus and mother of the church. Totus tuus (completely yours) was Louis's personal motto; Karol Wojtyla chose it as his episcopal motto. Born in the Breton village of Montfort, close to Rennes (France), as an adult Louis identified himself by the place of his baptism instead of his family name, Grignion. After being educated by the Jesuits and the Sulpicians, he was ordained as a diocesan priest in 1700. Soon he began preaching parish missions throughout western France. His years of ministering to the poor prompted him to travel and live very simply, sometimes getting him into trouble with church authorities. In his preaching, which attracted thousands of people back to the faith, Father Louis recommended frequent, even daily, Holy Communion (not the custom then!) and imitation of the Virgin Mary's ongoing acceptance of God's will for her life. Louis founded the Missionaries of the Company of Mary (for priests and brothers) and the Daughters of Wisdom, who cared especially for the sick. His book, True Devotion to the Blessed Virgin, has become a classic explanation of Marian devotion. Louis died in Saint-Laurent-sur-Sevre, where a basilica has been erected in his honor. He was canonized in 1947. Read a longer biography of St. Louis de Montfort's life. Read some of St. Louis de Montfort's works and/or read articles about his spirituality. Consider making the consecration to Mary recommended by St. Louis de Montfort. Resolve to pray the rosary daily starting today. Learn about the Missionaries of the Company of Mary (Montfort Missionaries) and support their work with your prayers, sacrifices and financial offerings. From the Catholic Culture Library The Spiritans and Under the Banner and Protection of Mary. She diligently dedicated herself to studies during the years of her secondary and university education, while, at the same time, applying her faith through generous apostolic service among the youth of Catholic Action and charitable work among the elderly and needy as a member of the St. Vincent de Paul Society. After earning degrees in Medicine and Surgery from the University of Pavia in 1949, she opened a medical clinic in Mesero (near Magenta) in 1950. She specialized in Pediatrics at the University of Milan in 1952 and thereafter gave special attention to mothers, babies, the elderly and poor. A few days before the child was due, although trusting as always in Providence, she was ready to give her life in order to save that of her child: "If you must decided between me and the child, do not hesitate: choose the child - I insist on it. Save him". On the morning of April 21, 1962, Gianna Emanuela was born. Despite all efforts and treatments to save both of them, on the morning of April 28, amid unspeakable pain and after repeated exclamations of "Jesus, I love you. Jesus, I love you", the mother died. She was 39 years old. Her funeral was an occasion of profound grief, faith and prayer. The Servant of God lies in the cemetery of Mesero (4 km from Magenta). "Conscious immolation", was the phrase used by Pope Paul VI to define the act of Blessed Gianna, remembering her at the Sunday Angelus of September 23, 1973, as: "A young mother from the diocese of Milan, who, to give life to her daughter, sacrificed her own, with conscious immolation". The Holy Father in these words clearly refers to Christ on Calvary and in the Eucharist. Gianna was beatified by Pope John Paul II on April 24, 1994, during the international Year of the Family. She was canonized on May 16, 2004, by Pope John Paul II.